The HE Academy/JISC UKOER Programme has encouraged cross-sector approaches to OER development, and is increasingly focussing on broader issues around open educational practices (OEP). Synthesis activities for the first two phases of activity have included cultural and institutional issues across a number of sectors. Activities to date include a UKOER phase 2 programme webinar on OERs across sectors , a presentation at the JISC Innovating eLearning Online Conference in November 2011 – Open practice across sectors and a recent TELP-SIG webinar on open practices. It is anticipated that phase three activities will continue to address cross-sector issues and identify good practice for the wider community. It has become clear that a significant benefit of engaging with the concepts and challenges of OEP and OER is in the way it encourages cross sector understanding, collaboration and outcomes. We invite you to read one of our new briefing papers which looks at the various motivations for different stakeholders across sectors in engaging with OEP and OER and it also identifies some synergies and differences between HE and HE in FE, NHS and employers. Recognising new or changing practice as ‘open’ or OEP has added to the complexity in the field as it needs defining and explaining – is existing practice becoming more open or does it require people to change their practice? 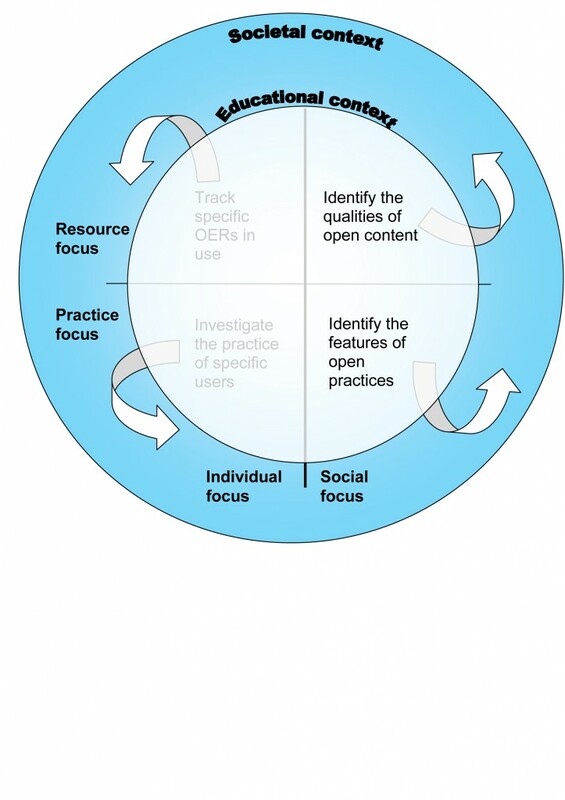 During the JISC online conference discussions many people argued that some people have been engaged in open practice (and even producing OERs) for many years but do not use this terminology to describe it. Whilst some may prefer not to use new terminology, it can be useful to engage people with the concepts and generate institutional-wide understanding that can be fed into strategy, policy and practice. It can also be valuable to situate open practices as an extension of existing practices, which may generate less anxiety or resistence and establishing OEP as a credible and valid form of scholarship has been identified by projects as one way of normalising these practices. What are your views on this? 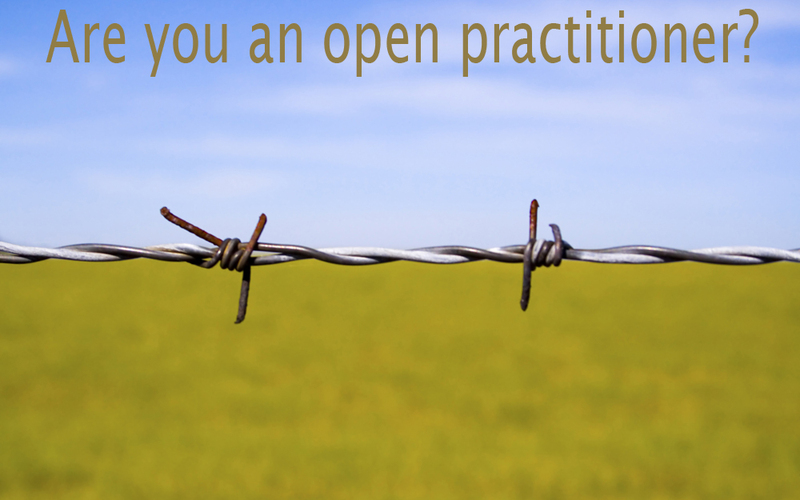 Are you already an open practioner? Posted by Lou McGill on March 6, 2012 in open educational practice and tagged briefing paper, open education, open practices, openeducationwk, UKOER. During Open Education Week, the JISC UKOER evaluation and synthesis team, Lou McGill, Isobel Falconer, Helen Beetham and I, are collecting together ideas for a Grand Challenge in the areas of Open Education or Open Learning. This is following on from my work with the EU-funded STELLAR Network for Excellence in TEL in developing ‘Grand Challenges’. A Grand Challenge is about taking the areas of Open Education and/or Open Learning to a new level. It’s about focusing global attention on a specific problem – a problem that is important but has not been solved. Through a Grand Challenge, we identify a problem, link people and disciplines to build new concepts and innovative solutions. Each Grand Challenge should be defined by a problem state­ment, rather than a solution, which is stated simply, measurable and time bound. Contextualisation – Groups of people directly involved with each Grand Challenge will bring to the project their practices, cultures and values, grounding emerging ideas and solutions in known ways of learning and working. A high degree of contextualization embeds the research and outputs within specific settings, reducing the risk of solutions not being taken up. Conversely, a high degree of contexualisation makes the abstraction and diffusion of concepts to other settings more complex. Interdiciplinarity – Inclusion of a wide range of disciplinary groups within a Grand Challenge enriches the outputs and solutions generated through the project. At the same time, the knowledge generated through the project is likely to be more abstract and less easy to apply directly to solutions across a range of different contexts. Consequently, projects with a greater the number of disciplines tend to be more complex and incur a higher the risk that the outputs will not be adopted widely. Timescale – The timeframe for the impact of concepts and solution on human learning is proportional to the complexity of the Grand Challenge. Complex, interdisciplinary projects will require a longer timeframe for the adoption of solutions, as knowledge is diffused across and interpreted by different stakeholder groups. Let me know your ideas for a Grand Challenge in Open Education or Open Learning by writing a short problem statement. Outline the context, disciplines required to seek solutions, timescale and measures (ie how we will know the Grand Challenges has been completed). By 2022 learners will be able to use and contribute to all knowledge from publicly funded projects. The project will include researchers from information, organisational, social and learning sciences, computer and material scientists as well as research funding bosdies, schools, colleges, universities, health services, museums, NGOs, legal entities and government agencies. By 2012 all public projects will be asked to identify how learners can have access to and can contribute to the project knowledge prior as a condition of a funding agreement. Posted by allisonlittlejohn on March 5, 2012 in open educational practice and tagged open education, open practices, openeducationwk. We are currently going through UKOER3 project plans and drawing out key themes and areas of activity to map these against our synthesis and evaluation framework. We use the framework as an iterative tool to support both evaluation activities of projects and synthesis activities of our team. It highlights core areas of inquiry and identifies evaluation questions that projects intend to address. We started with a working pilot phase framework in 2009 which has since been through several iterations. The latest version of the framework was created at the end of phase 2 in November 2011 and links to evidence from projects. We are currently revising this framework to reflect phase 3 activities and questions (coming soon!). We have listed phase 3 projects and their evaluation questions and themes/areas on a new wiki page and the wordle is made from the terms in the third column of this page – themes/links. UKOER projects may find this wiki page useful to identify other projects to make links with. The funding call for the THEMES projects did identify 4 themes which has obviously shaped some of the focii. It’s early days for phase 3 but what strikes me so far is that the issue of student created OERs has emerged as a more prominent focus this year. Identified by a few projects in the pilot phase as an area of interest, raising issues around ownership, digital litercaies, and licencing, it failed to attract alot of interest during phase 2 with only a few projects including student content as part of their OERs. I am pleased to see this re-emerge (under the banner of Enhancing the student experience) because I think this area needs investigating more. Cross -sector partnerships continue to be a major theme and this phase will see several projects taking up the challenge of working with publishers – indeed new OER publishing models are being considered and hopefully developed during this phase. 3rd sector agencies as partners have also emerged with several projects working with charities and the voluntary sector – another area to watch with interest. Some projects plan to work with industry, NHS, skills councils and SMEs, continuing some interesting work that was carried out during phase two with these groups. Projects will continue to work across educational sectors and schools also feature as partners in some projects. We have been working on a briefing paper which highlights issues emerging during phase 2 around open practice across sectors. We expect this phase of activities to inform and expand on this work. Digital literacies featured strongly during phase 2 and continues to be a focus area for many projects, as do research skills and academic practice, with the OMAC strand particularly focussing on this area. The OMAC (open materials for accredited courses) strand aims to build on the outcomes of phase 2 and focuses on the release of materials linked to the new UK Professional Standards Framework (UK PSF) for staff who teach in higher education. One of the challenges for UKOER project timescales is that they often underestimate the time taken to release the OERs and have little time to find out how they are used by different stakeholders. We may find that projects are able to report more about this (particularly academic use of OER) as some projects are intending to re-use existing OERs. Several projects have included a remit to investigate student use of OERs – another area which should be of significant interest to the community. Posted by Lou McGill on February 5, 2012 in evaluation, UKOER Phase 3 and tagged activities, evaluation, oer, open practice, synthesis, themes, UKOER, ukoer3. The evaluation and sythesis team took part in the UKOER3 startup event in Birmingham on November 14th 2011. The event brought together the 18 projects in UKOER3 with the programme leaders and relevant support groups, including CETIS, JISC Legal, JorumOpen and the E&S team. I (Allison Littlejohn)was representing the E&S team, while the others from E&S ((Helen Beetham, Lou McGill and Isobel Falconer) participated via Twitter. Our role in UKOER3 is to lead the evaluation of the programme from October 2011-October 2012. 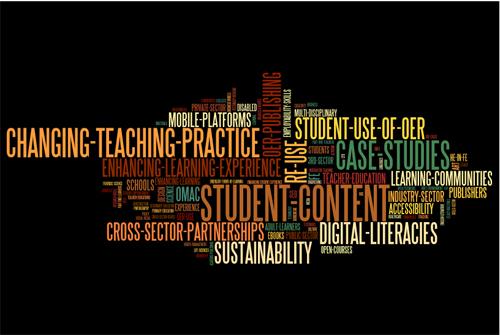 We are working with all 18 UKOER projects to identify key messages for the JISC, the HEA and the sector as a whole. We are delighted – and excited – to be leading the evaluation and synthesis of the programme, building on our work in phases 1 and 2 . During UKOER2 (20010/11) we identified key benefits and motivations for academics and institutions to create and release Open Educational Resources – see our UKOER2 final report http://tinyurl.com/bu5lvge which was launched the the UKOER3 startup. In phase 3 we will evaluate the programme using the synthesis and evaluation framework we developed through phases 1 and 2. The framework has a number of key themes, each with a range of evaluation questions that are asked by project teams as they carry out their individual project evaluations. The data they collect was mapped to the questions in the programme evaluation framework, providing an overview of key issues and trends across the programme. Thus we identified key lessons learnt and outcomes and highlighted significant outputs that demonstrate evidence of this. Posted by allisonlittlejohn on November 22, 2011 in UKOER Phase 3 and tagged programme meeting, UKOER, ukoer3. Well the cattle have been rounded up, the settlers have lit their home fires, and the preacher and the gadabout are safely departed to bother someone else. 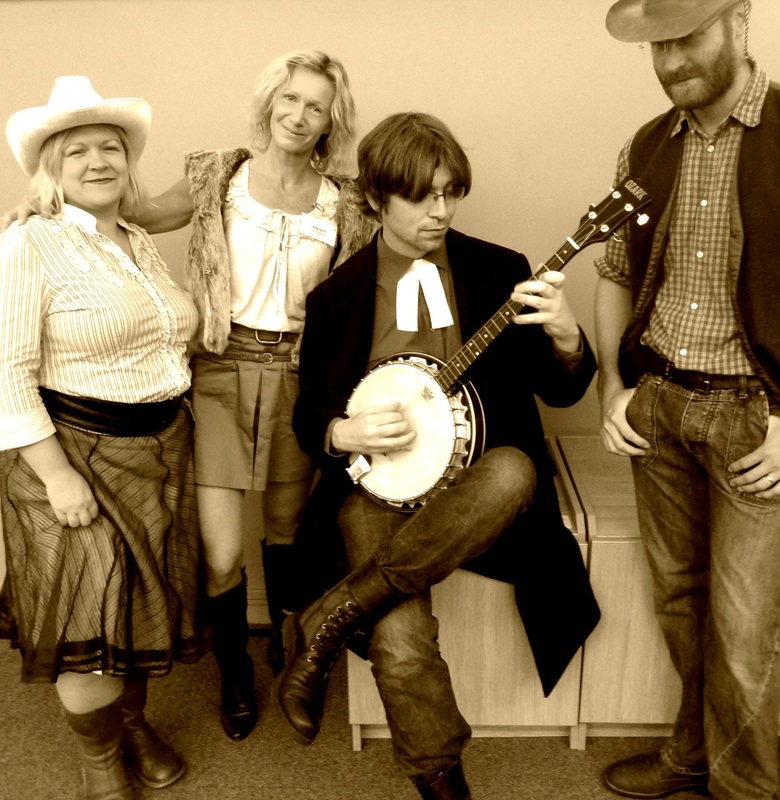 Apart from the comedy value of our session on open country (blogged by David Kernohan at http://followersoftheapocalyp.se/oer-the-cowboy-gospel-altc2011), what were the serious messages from the debate at Alt-C? David White (in the cowboy hat) offered the insight that the open use/reuse of online content is now so deeply embedded that on the demand side there is little need for the term ‘open’ – though arguably the term ‘educational’ might be more distinctive of the kinds of content being developed by the OER programme in the UK. Amber as the ‘lady sheriff’ described how open standards (the ‘law’) can facilitate relations in open country but also emphasised that institutions have to continue to deliver learning at a time when existing models of higher education funding are under threat. We should beware snakeoil salesmen bearing the promise that open content can fill the void when teachers are dismissed. Finally, my own slides (http://www.slideshare.net/hbeetham/open-country-hb) explore some issues emerging from final reports, which no doubt will be expanded on as we dig deeper. It has been exciting to see so many projects not only producing and sharing more resources under the UK OER banner, but reflecting deeply and productively on the wider issues of open education. There are a number of papers and symposia at this year’s ALT conference that will be interesting to UK OER projects and followers. Links are to the Crowdvine site which requires a conference log-in. Papers may well be mirrored in other locations at a later date. The Paradox of Openness: the high cost of giving online explores the real costs of online participation and sharing of resources. It asks, among other things, whether content sharing via open platforms is always ‘fair’ and whether academic communities can sustain open practices in times of financial constraint. Making open educational resources happen comprises three short papers with several presenters from the UK OER programme. They explore designing for openness, supporting openness in institutions, and open content for interprofessional learning. The World Collaboration session includes discussion of a proposed open learning exchange – not exactly open content, but drawing inspiration from the mutual sharing of content as a model. Are we in Open Country? is a UK OER symposium with a wild west theme (!) that explores the promise and reality of working with open content. I plan to draw on emergent findings from some of the phase 2 projects, along with my co-presenters, to ask whether some of the wilder promises of the open content movement are relevant to life in present day universities and colleges, and what open practices are most valuable in uncertain times. Three high profile UK OER projects combine to present Happening Resources, a session that touches on accessibility, OER in clinical education, and the role of the SCORE Fellows in advancing OER research and practice. Finally, the session on the GLOmaker Tool could be of interest to those designing reusable open content from scratch, and for those concerned about the digital literacy of end-users. The team is curently working on final synthesis for phase 2 and is busy populating the wiki as we go. The final report and outputs will all be made available through it. As it grows I am concerned about people finding stuff in the mass of information. There is a side bar which, hopefully provides some navigation through the content from the different phases. I have added a link to the tags page which is a really useful list of tags and all the pages that have those tags assigned. There is, of course, also a search feature. Posted by Lou McGill on August 30, 2011 in synthesis team and tagged oer synthesis wiki, retrieval, tags. A high-octane meeting this week with the folk from the TALL team and their OER Impact Study http://oerblog.conted.ox.ac.uk/. It let me to sketch out the area that I think we are gathering evidence about in the Eval and Synth team, which is a more detailed picture of the two right-hand quadrants in the diagram posted below (features of open content, and aspects of open practice). On the left side are some emerging practices in learning and teaching that could arguably be called ‘open’. OERs are *involved* in these practices, sometimes as signs that they are going on, sometimes as drivers to make them happen, sometimes just in the background. So OER practices are a sub-set of these more open learning and teaching practices and it’s our task in the Eval and Synth team to gather evidence about whether and how the subset of practices promoted by UK OER are supportive of these larger movements. On the right hand side are some features of content that arguably makes it more reusable in an educational context – makes it more likely to partake helpfully in some of the practices on the left. We are familiar from UK OER pilot projects with the challenges and costs of moving content in these directions. However, we need more evidence of whether – and how – these features of open content actually support educational re-use. We have focused a lot on open licensing, which is critical for repurposing, but the focus in this phase is more on reuse and it may be that other features of open educational content are actually more significant here. The ‘E’ may be just as important as the ‘O’. From the literature we know that OER release is influenced by the nature of the resources and the practices around OER creation, release and reuse. Resources release and the practices around them can be considered individually (ie the practices of an individual learner or teacher releasing or reusing resources) or socially (ie the practices of groups or collectives releasing or reusing resources). The release of OERs and practices around these is situated within the wider educational context of Further and Higher Education. Within this broad context individual and social practices influence the release of different types of OERs, and the release of these resources, in turn, affect the institutionally based practices associated with them. Further, we recognise that these practices and resources exist within a wider societal context in which open practices and resources are evolving rapidly. 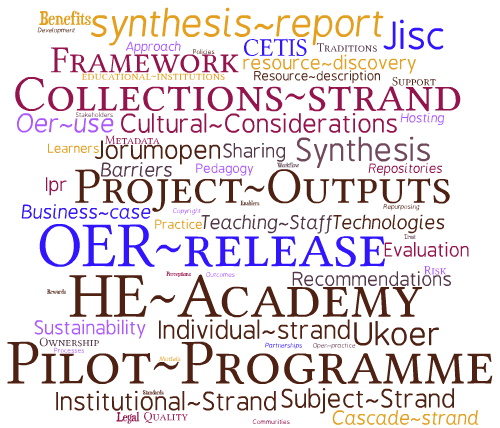 These aspects of OER release are integrated in the UKOER Impact Model below. Individual impact (the left hand side of the model) is being explored by other parts of this landscape are being explored by other funded projects, for example the OER Impact Study, led by the TALL group at the University of OxfordOER Impact Study, and﻿ Open Resources: Impact on Learners and Educators﻿ (ORIOLE), led by the UK’s Open University). Through our evaluation of the whole JISC UKOER programme, we are focusing on examining the right hand side of the model, taking a social focus. Posted by allisonlittlejohn on May 17, 2011 in open educational practice, UKOER Phase 2 and tagged impact, model, UKOER. The team recently prepared a presentation for the programme’s Senior Advisory Committee. Allison Littlejohn presented on behalf of the team. We have put a more comprehensive page describing our thinking and outcomes from the programme so far on our wiki – https://oersynth.pbworks.com/w/page/40291776/UKOER-Impact-Model. This page brings together some of the thoughts previously shared on this blog. Posted by Lou McGill on May 17, 2011 in open educational practice, UKOER Phase 2 and tagged impact, model, oer release, open practices, UKOER.